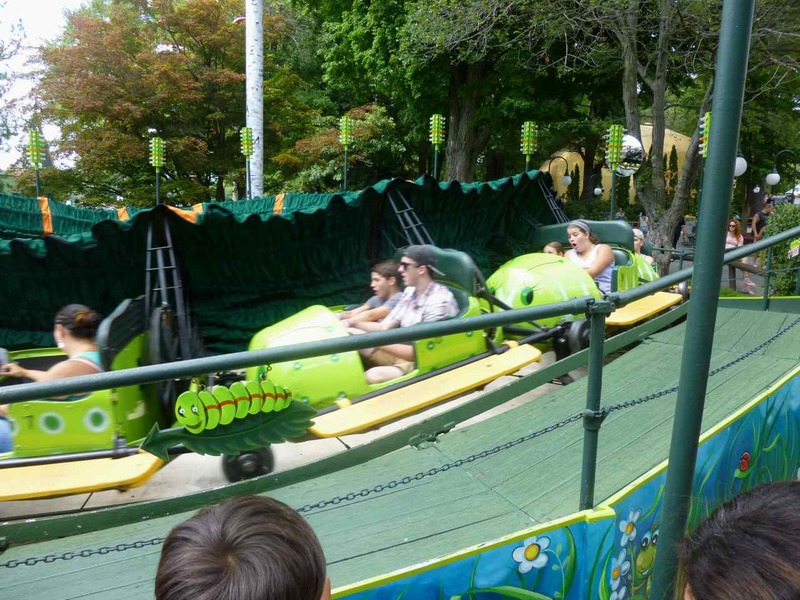 Another ride Canobie Lake Park has that used to be common, and is near extinct, was the Rotor. This is your classic centrifugal ride, standing in a tube and spinning around until you stick to the wall, and then they drop the floor out from under you. I hadn't been on one since Great Adventure in the early 90s. I'd always liked it because, hey, centrifugal force. And a dropping wall. And an observation platform, another thing that's almost extinct in rides. The park has one, called the Turkish Twist and decorated like the Roller Coaster Tycoon concession stand selling Turkish delights. The ride queue didn't take us up to the observation platform and we couldn't figure any way up there. Somehow other people did, though, and we don't know what it was they figured out that we didn't. Here's hoping it keeps spinning. They have a super-flume ride, the kind that gets you really and truly soaked, called the Boston Tea Party. It's on the lakefront, in a section that's themed to Old New England and that's pretty charming. It was really packed, though, and for all that it was a bright sunny day it wasn't warm enough for us to go on a soaking wet ride like that. But we did, in the Old West themed park, go on their Policy Pond Log Flume. That name, according to a ``facts'' sign in the launch station, ``is derived from the former names of Canobie Lake'', which almost but not quite explains the name. It's a log flume from the early 80s, and most of its time is spent winding through the forest and ground level which makes it feel nicely ... well, like actually riding in a canoe. The flume is not all that soaking and we came through without getting too wet, mercifully, since it was near sunset by the time we were able to ride. Also in the Old West section is a dark ride, the Mine of Lost Souls. This had an agonizingly long line the first time we went past it and we feared we'd just have to give up on that. But a half-hour or so later, and after some more walking around and doing stuff, we looked again and the line was down to something tolerable. Nice. The ballyhoo for the ride speaks of two boys from Salem discovering gold in a cavern, and disappearing into hidden passageways, enter if you dare, et cetera. People loaded slowly into the trains going into the Mine of Lost Souls and we weren't sure just why. It's not a complicated car, just, hop in, buckle up, and let the bar slide down. For some reason this was slow going. Something we went on in the middle of the day, unwisely, was the Tiki Maze. The name and bits of its theming are great, but it's just a plexiglass-walled maze. They design the things so that they're hard to get really lost in, but I'd forgotten that it's completely impossible to get lost in one of those things in broad daylight. Had we waited for evening the ride would probably have been better. Wikipedia claims the ride was ``Formerly the Crystal Orbiter, on broken motor-driven platform''. This would explain the circular shape of the outer platform and I imagine if the whole ride were rotating it'd be a little more disorienting and probably a bit better fun at that. There's a decent number of older-looking rides, mostly kiddie rides, and we spent some good time admiring them and their ancient control boxes and the like. 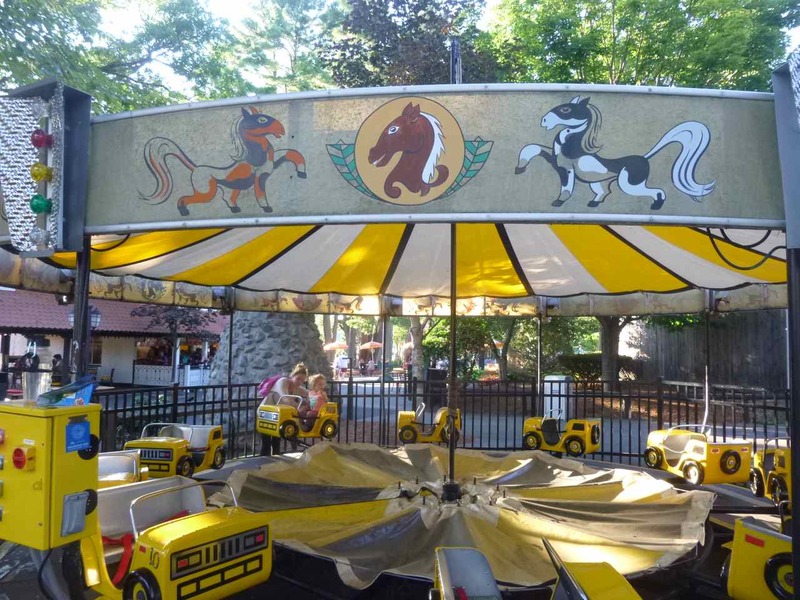 They had classics like a kiddie carousel, yes, and boats and cars that go in endless loops and such. Some of those had clearly new cars on the tracks, but still had running boards featuring 50s-style modernist horses or tigers or hippocampuses or the like, often set against a gold-leaf-patterned background. They also had a kiddie spaceship ride, with the cigar-shaped spaceships featuring the NASA ``meatball'' logo redone with ``CLP'' across them. 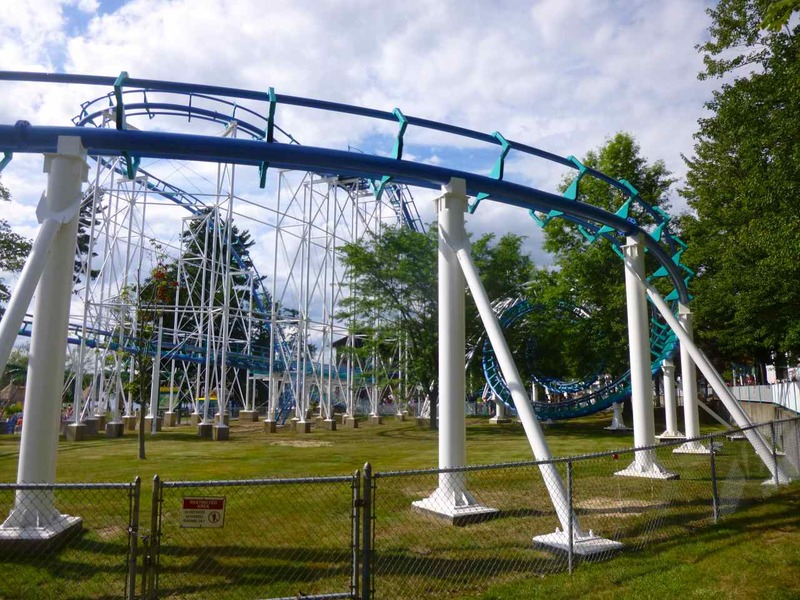 It was only then that I realized this park and Conneaut Lake Park had the same initials. If I'd been thinking it out I'd have worn my Conneaut Lake Park shirt here. Lesson learned for next time. Trivia: The New England Confectionary Company (NECCO, of wafer fame) introduced profit-sharing plans to its workers in 1906, and company-sponsored life insurance in 1920. Source:	 Sweets: A History of Temptation, Tim Richardson. Currently Reading:	 Three Weeks In Quebec City: The Meeting That Made Canada, Christopher Moore. PS:	The Set Tour, Stage 2: The Real Star, talking about what's probably the most popular domain for functions.